There is no one pottery that appeals to everyone. Ask any woman decorating a home or office. Tastes are reflected in textures, colors, shapes and patterns. That’s the way it is with Okinawan pottery, which shares cultural values with ages old hand shaping and moulding. Okinawa’s contributions to pottery trace back to its early days as the Ryukyu Kingdom, when traders sailed the waters between Korea, mainland Japan, China and southeast Asia nations. Local artisans studied the varied pottery styles, picked what they considered the best of each, and handcrafted their own products. A royal directive from the Shuri Court, issued more than 300 years ago, set Okinawa on the road to becoming a pottery powerhouse in Asia. Okinawa’s king directed local pottery operations and kilns in the villages of Chibana, Wakuta and Takarguchi to merge into a single plant in Tsuboya, a downtown neighborhood in Naha. The king’s goal was to make Okinawa pottery a dynamic part of inter-Asian trade that also included lacquerware, leather, weaving and other arts and crafts. Tsuboya Pottery began production in 1609. drawing upon royal patronage to become a strong, creative industry. The distinctive Ryukyu pottery breaks down into two types: glazed pottery, or joyaki, and unglazed pottery, or arayaki. Both treatments of the clay contribute to the warmth of the Okinawan islands and peoples. Wood burned night and day in the ancient kilns as craftsmen patterned thousands of down-to-earth pieces around the clock. Only one woodburning “arayaki climbing kiln exists in service today, and that’s in the Tsuboya pottery district of downtown Naha. The others have all become victims of the modern era, replaced with pollution free natural gas. The lone survivor is now protected by designation as a prefectural cultural property. The uniqueness of pottery is wrapped in its very simplicity. Earth. Dirt. Clay. Water. Mixed by mother nature, then enhanced by human hands, the shapes are as diverse as the artisans who kneaded the sticky elements into objects. Pottery dates back centuries upon centuries, not only in Asia but around the world. Artifacts of ancient cities uncovered tell much of a peoples’ heritage by the shards of broken pottery that once were plates, water pitchers and vessels, and storage containers. Flashbacks to history are common as each pottery piece tells a story of the ages. Yet even as its simplicity paints the images of ancestors, it evokes desires to have pottery in our homes and offices. Today you find Okinawan pottery in everything from pots and jars to plates, cups and other dishes. It’s also common in traditional Okinawa funeral ceremonies, housing the ashes in specially formed urns. 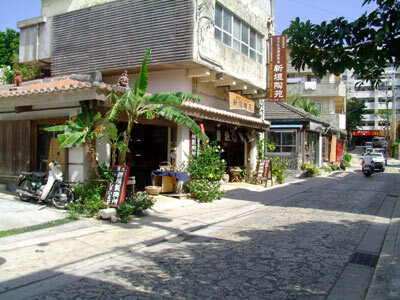 The unglazed pottery, the arayachi yachimun, is distinctly Okinawan. In forms perfected by local experts, the giant earthenware jars became common for inter-Asian trade as businessmen transported everything from grains to liquors from one region to another. The best forms, today’s potters will tell you, uses a blend of rich, dark soil and red clay. Toss in some local limestone, mix well with water, let sit a bit, hand mix some more, and you’ve a winner. The key, of course, is heat. Fire cranked to temperatures in excess of 1100 degrees celsius are needed to cure the molded clay. The process takes roughly 48 hours, in stages of medium, high and very high heats. The products are left to cool, another several days. More creative artisans turned to joyachi yachimun, the glazed pottery form filled with rich colors and subtle nuances. The skills were originally transferred from China and perfected by Okinawans working under directions of the Shuri Castle leadership. The glazes make all the difference, and even today there are numerous varieties used in Okinawa. Colors, ranging from crystal clear or transparent, to warm toned aqua and green, to cobalt blues, bring life to pottery, whether a simple bowl or a sophisticated vase. Regional variances add to the natural beauties. Okinawa’s southernmost islands, the Yaeyama group, has its own distinct style that today sells well with tourists and art stores. 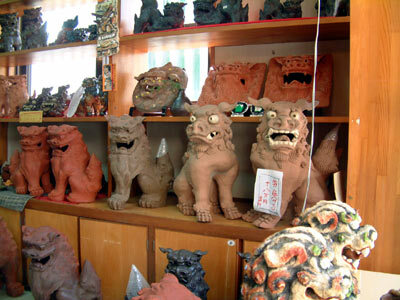 Tsuboya Pottery District is a mecca for the art challenged. There are stores to be wandered, products to be handled and stroked, and others yet to be made. There are many studios and shops open to the public. Some even let the customers join in. The hub is a three-story Tsuboya Pottery Museum, opened in 1998. It’s in downtown Naha, close to Kokusai-dori, the International Street. In fact, the sprawling catacombs of HeiwaDori market connect with Himiyuri Dori, very close to the Museum. Bus 17 will deliver you from Naha Bus Terminal as well. The museum has more than 650 items on view. The movie presentation is in Japanese, but easy to watch.